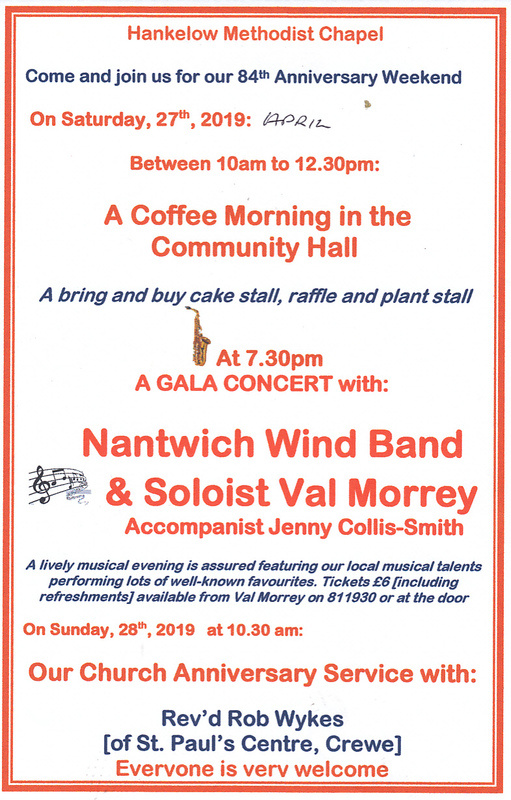 A warm welcome awaits you at our Sunday morning services at 10.30 a.m.
Hankelow Methodist Church is celebrating its 84th Anniversary on the weekend of 27th/28th April. There will be a varied program of events. The meeting room with kitchen facilities is available for hire at £10 per hour. Please contact one of the people on the Chapel contacts list below for more information. To enquire about any aspect of Chapel life, please either telephone Val Morrey on 811930, or email Roger Millns at .